The perfect costume for a trip to Grandma's house. 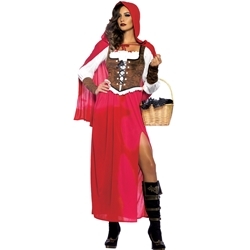 This Classic Red Riding Hood Adult Costume is a sophisticated take on the well-loved fairy tale character. Costume includes dress with high slit skirt, ruffled long-sleeve blouse with attached laced bodice, hooded capelet, and matching wrist gauntlets. Available in women's adult size small (4-6), medium (8-10), large (12-14), and plus size (22-26).